"Things are never as bad as they seem - usually they're worse." Profile: If Dreadwind is the ultimate pessimist, Darkwing completes the equation by being a manic-depressive. He believes that life is one long ordeal of pain and suffering, and that it's pointless struggling against it. However, where his brother-in-arms just sits back and lets this bleak outlook get him down, Darkwing is no passive bystander. If he's destined to suffer, then by Primus he's going to make others share it... only more so! His avowed purpose in life is to make the lives of others worse than he believes his to be! To him, death is getting off lightly. Better to leave a foe still alive, in terrible pain. He somehow feels better knowing that others are suffering more than he is. But there is a side to Darkwing that's every bit as gloomy as Dreadwind. No matter how well things are going for him, he's convinced that it's not going to last. To Darkwing, the next personal disaster is always just around the corner. If nothing else, this attitude keeps him alert to impending attack. He's partnered to Throttle, a (self-admittedly) low-life thief. He revels in his chosen profession and loves mixing with society's dregs. Throttle sees this as simple honesty and appreciates that in others. If he doesn't like you, he'll tell you in no uncertain terms. With Throttle, what you see is what you get. In a way, that's why he gets on okay with Darkwing (though Darkwing might have something to say about that), because at least Darkwing doesn't pretend to be anything he's not. So he's a pessimist - so what? Abilities: Darkwing's jet mode abilities mirror Dreadwind's almost exactly. 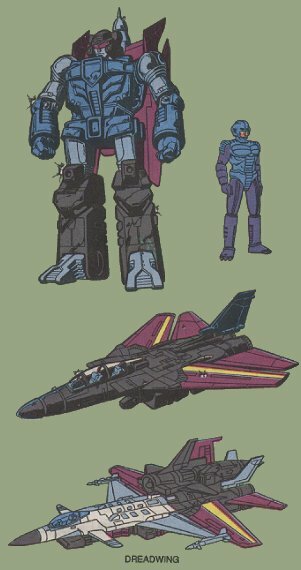 Darkwing combines with Dreadwind to form the vehicle Dreadwing, so they are not so much two jets as two halves of the same jet. Fast and deadly, Darkwing is similarly laden with weaponry, the most deadly of which are his two laser-guided electro-kinetic blasters, which turn an enemy's power against its owner. The more powerful the foe, the more Darkwing can hurt him. Unlike Dreadwind, he is mobile and lethal in robot mode, specializing in hand-to-hand combat. Weaknesses: If he weren't teamed with such a reckless hothead, Darkwing could probably claim to have no weaknesses. As it is, Throttle is so keen to prove himself that he over-exerts himself in engine mode, desperately trying to outdo Dreadwind, and overheats. When this happens in the heat of battle, it can have disastrous consequences, leaving Darkwing high and dry and a sitting duck. Darkwing hates combining to form Dreadwing, and is often distracted by continually bickering with Dreadwind.